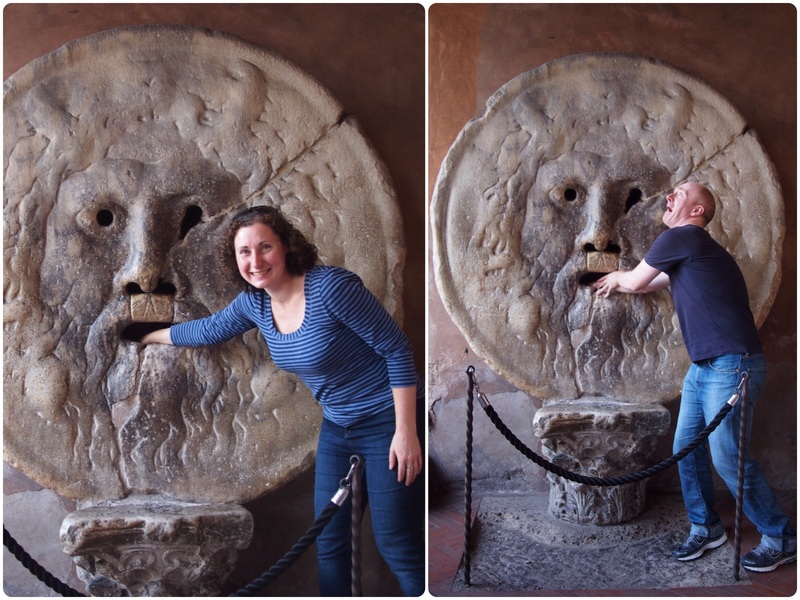 There are some headline sights in Rome but staying for a month meant we were able to sniff out a few of the city’s less well known corners as well. 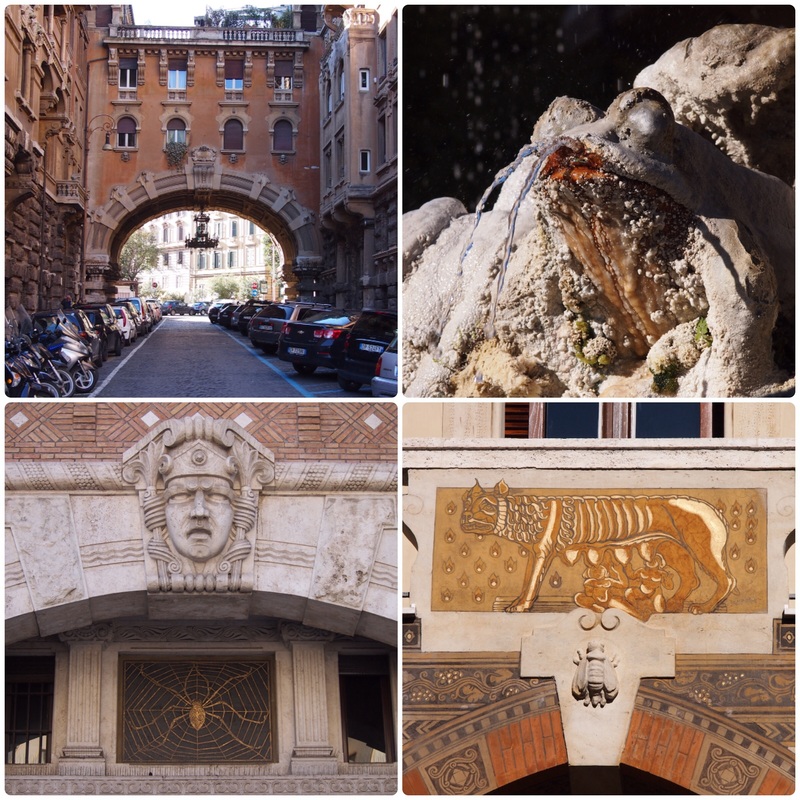 It’s impossible not to notice the ancient history in Rome, but it is also possible to find reminders of its 20th century history here and there as well. We booked a tour of the bunkers at Villa Torlonia where Mussolini lived with his family from 1929 until his arrest in 1943. The tour took us through two air raid shelters and a bunker which was still under construction when Mussolini was arrested. Each was built with three exits in case debris from bombing blocked the others, and some original features still remain, for example, one of the air filtration systems and some gas masks. 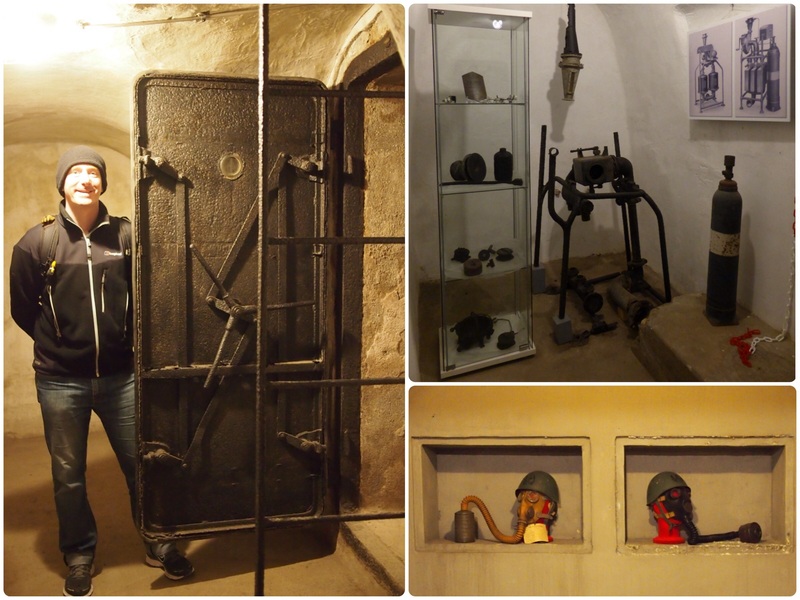 We were surprised to see how small the shelters are, but of course they were only designed to accommodate one family with their servants, unlike the huge Soviet bunker that we visited in Latvia or the air raid shelters in Malta and Naples. 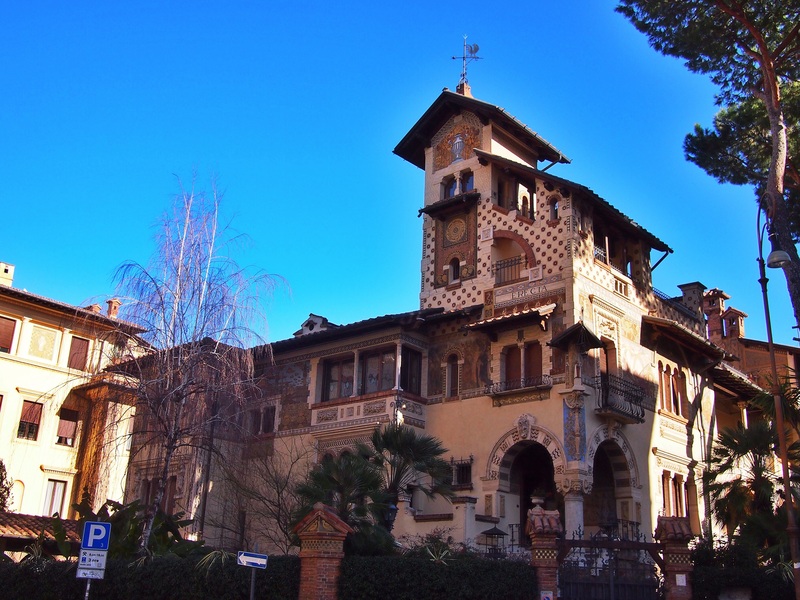 About a 15 minute walk from the Villa Torlonia we found a whole neighbourhood of elaborate Art Nouveau architecture. Designed by Gino Coppedè and bearing his name it was a bit of a surprise in Rome, and reminded us of the Art Nouveau walking tour that we did in Riga. The most elaborate buildings line Piazza Mincio with its central ‘Fountain of Frogs’, but we found others tucked away in the surrounding streets. OK this corner isn’t remotely hidden (there was even a 20 minute queue in the middle of February) but it’s a fun photo opportunity if you’re passing. The huge stone circle carved with the face of an ancient god originally dates to the 2nd century BC. In the Middle Ages it gained a reputation for biting off the hands of liars (possibly assisted by someone with a sword hidden behind it! ), hence why everyone wants their photo taken with their hand in its mouth. You might also recognise its image from fortune telling machines at fairs, and if you haven’t seen the 1953 film Roman Holiday I highly recommend watching this clip of Audrey Hepburn and Gregory Peck visiting it. 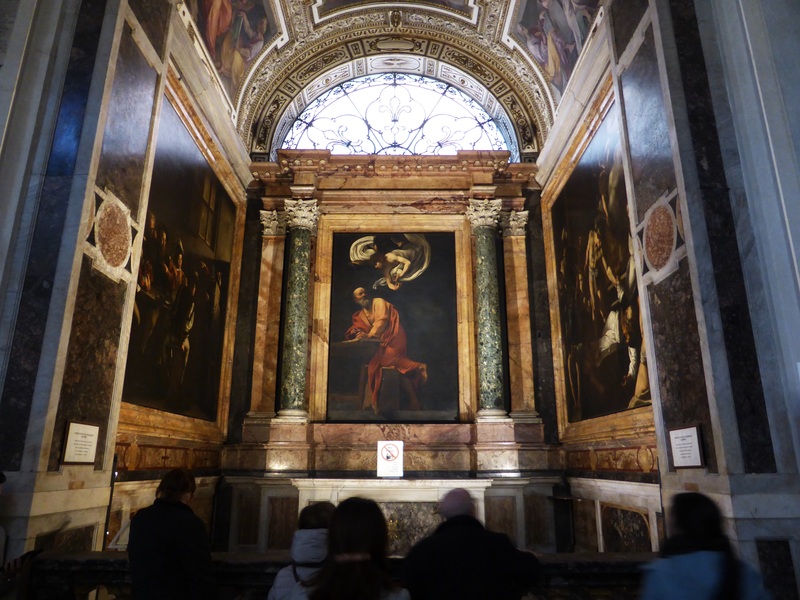 Just a block away from the Pantheon, this small church has no less than three paintings by Caravaggio (the same number as the whole city of Naples!). The paintings here depict various episodes from the life of St Matthew and are housed in a side chapel, called the Contarelli Chapel, which is to the left of the main altar. The church itself is the seat of the Cardinal of Paris in Rome and, as with most of Italy’s churches, there’s no admission fee although they have cunningly left the chapel containing the Caravaggios in shadowy darkness so that if you want to see them you need to feed a nearby meter with a few coins to turn on the lights! Keep your tongue in your head, as the Pope enjoys barbecue. This museum is a little way out of the centre of Rome though it’s easy enough to reach by metro. 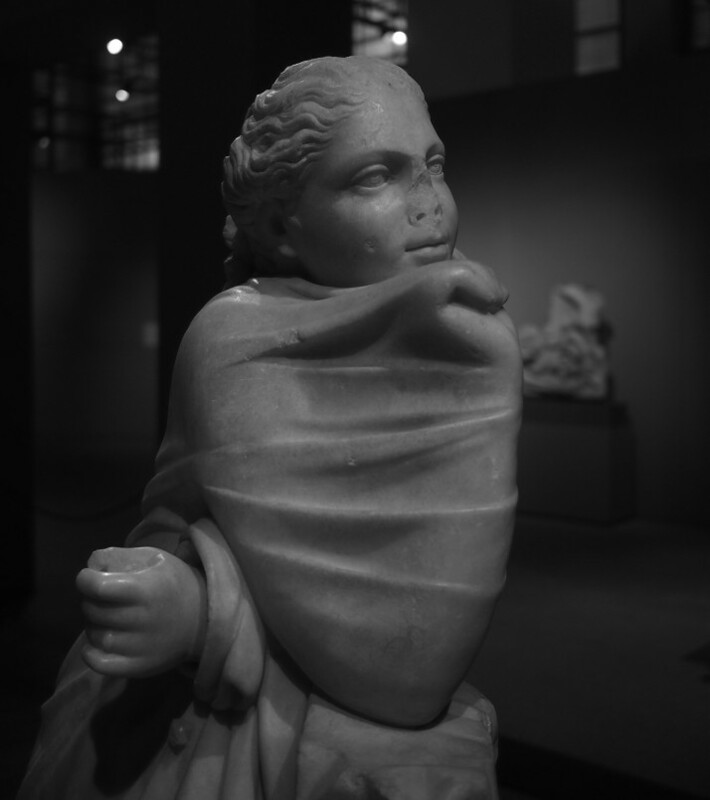 Basically it is a gallery of Roman sculptures but with a twist. 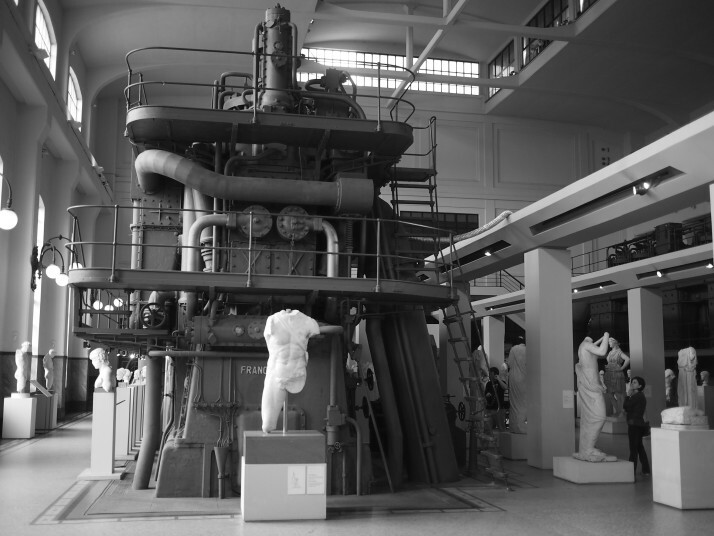 When the main Capitoline Museum was renovating some of its galleries in the late 1990s, it moved the statues to a temporary home in this former power plant. The result was so successful that it is now a permanent museum. We loved the juxtaposition of the white marble figures against the dark industrial machinery as well as trying to work out the function of the various engines and boilers. This one is truly off the beaten path. Hop Corner is a tiny pub specialising in craft beers and is less than 10 minutes walk from the apartment where we stayed. We expected a range of good quality lagers and were bowled over on our first visit when we found five cask beers on tap including an excellent bitter and a stout, not to mention fridges packed with bottled options. Needless to say, we were back for more. 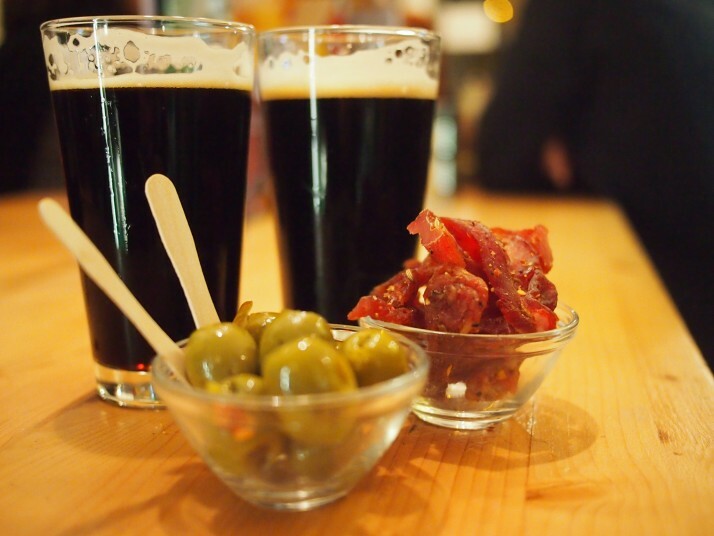 We also liked that with each round of drinks the snacks served with them levelled up (1. tortilla chops and olives, 2. beef jerky and olives, 3. a plate of porchetta, Italian roast pork!). They also do a range of different Spritzes but we couldn’t pull ourselves away from the beers to try those! The Stadio dei Marmi, or Stadium of Marbles, was inaugurated in 1932 and is part of the Foro Italico, formerly Foro Mussolini, a large sports complex containing swimming pools, tennis courts, a football stadium and the offices of the Italian Olympic Committee as well as this running track and sports field. 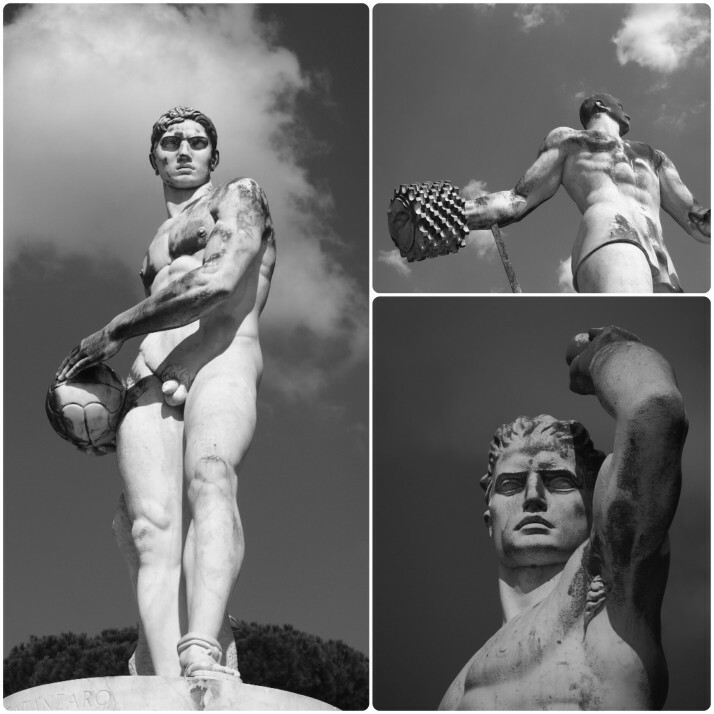 The “marbles” of its name are 60 statues of male athletes in Italian Fascist style, each donated by one of the Italian provinces. The statues were interesting but we really enjoyed sitting in the sun in this quiet spot and it was good to see how many people were out on a Saturday morning exercising or playing football with their kids. 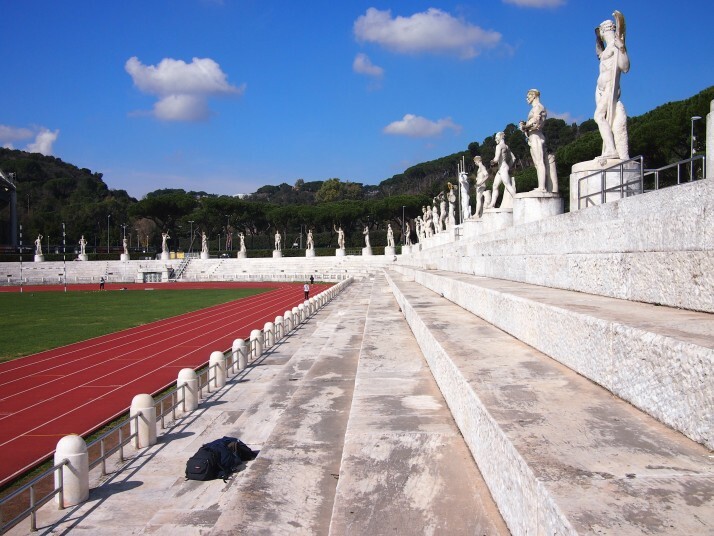 Statues around the Stadio dei Marmi. If anyone knows what sport is being depicted in the top right picture please leave a comment below! And now for something completely different… In stark contrast to all the art and history, we discovered that Rome has a Video Game Museum (VIGAMUS). The entry fee not only covered a surprisingly interesting exhibit telling the story of the birth of computer games but also as much time as we wanted playing the various free games that they had set up on all kinds of consoles as well as arcade machines. 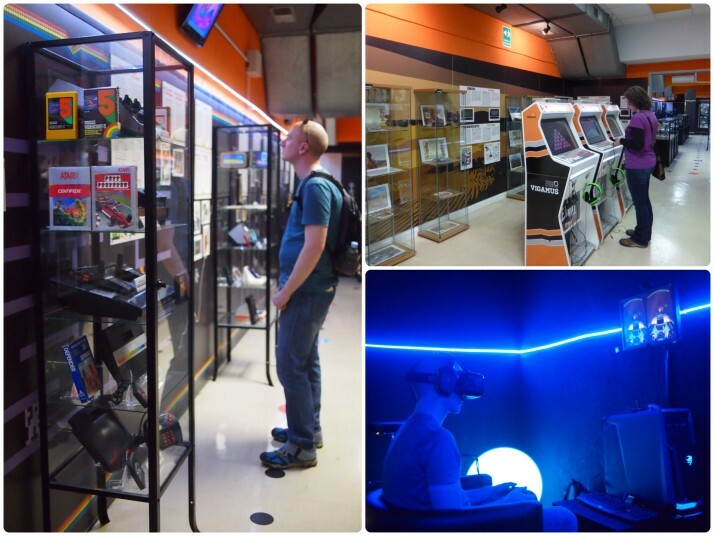 Playing on the games reminded us of the afternoon we spent in the arcades of the Akihabara district in Tokyo. The ticket also entitled us to a go on one of their Oculus Rift demo sets, this is an immersive type of gaming with a headset consisting of goggles displaying a picture which moves as your head does, it is touted as the future of video games. 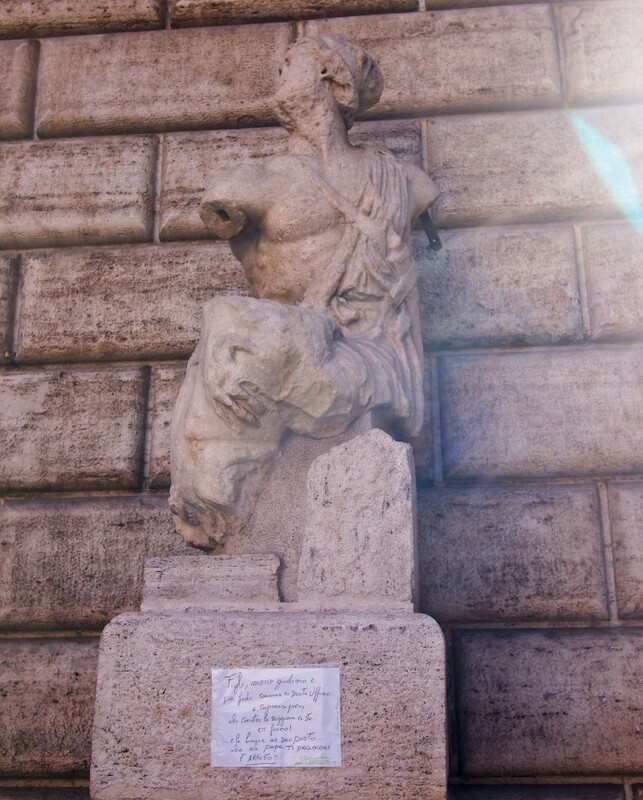 This entry was posted in Places and tagged Architecture, Art, Italy, Museum, Rome on March 6, 2015 by Julie. fantastic place and worth a visit. Hi, no we didn’t make it there. I’ve just had a look at some pictures online and it looks very strange (in a good way!) – one to add to the list for when we go back I think.